Thursday 16 February: Labour Behind the Label will join the TUC, UNISON and other unions at a protest today at the Bangladesh High Commission in London, to demand an end to the repression of trade unions and the release of arrested unionists. See below for the full press release from the Clean Clothes Campaign. In the latest move in a programme of systematic intimidation of Bangladesh’s trade union movement, nine members of the Bangladesh Independent Garment Workers Union Federation, an IndustriALL affiliate, were detained over the weekend of 11-12 February in Chittagong after police interrupted a training session in union offices. The new arrests, and, in particular, the targeting of national-level union leaders, represent an escalation of the government’s campaign of repression against the Bangladesh’s unions. An international campaign launched by the Clean Clothes Campaign alongside a joint union campaign by global union federations IndustriALL, UNI Global Union and the ITUC, are calling for an end of the repression of trade unions in Bangladesh, with a day of action planned for Thursday 16 February. The TUC, UNISON and other unions, and Labour Behind the Label and the Clean Clothes Campaign, will hold a protest outside the Bangladesh High Commission in London at 12:30 on Thursday. We will call for an end to the crackdown and the withdrawal of all charges. 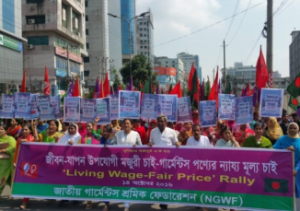 Since December 2016 at least 26 trade unionists and garment workers in Bangladesh have been jailed for participating in a strike following demands to increase the minimum wage. In addition, more than 1,600 workers have been fired and police have filed cases against 600 workers and trade union leaders, including charges of terrorism. The government of Bangladesh is clearly using the strike as a catalyst for a broad crackdown on trade unions. Many union leaders have gone into hiding for fear of being arrested and union offices have been closed and vandalised. The nine trade unionists in Chittagong have been released on bail, but the charges have still not been dropped. Protests will be held at Bangladesh Embassies across Europe and North America this week, in order to demand an end to the biggest crackdowns on workers’ rights ever seen in the country’s garment industry. As part of the #EveryDayCounts campaign, activists from the Clean Clothes Campaign will join with the International Trade Union Confederation (ITUC), UNI Global Union and IndustriALL Global Union to call for an immediate end to the persecution of garment workers, trade union leaders and worker activists in Bangladesh. Since December, over 35 trade union leaders, organisers and workers have been arrested and detained for taking part in protests. The call for action has been issued after weeks of intense anti-union repression by the government and factory owners following a non-violent work stoppage by hundreds of workers in Ashulia – an industrial area close to the capital Dhaka – to demand an immediate tripling of the minimum wage. Bangladesh garment workers remain the lowest paid garment workers in the world, and have not received a pay rise in over three years, despite soaring inflation in the cost of basic goods. Anti-union repression has dramatically increased over recent weeks, impacting on workers and unions across the country. The latest arrests took place on Friday February 10, when nine members of the Bangladesh Independent Garment Worker Union Federation (BIGUF), including senior leaders of the organisation, were arrested in in Chittagong, a port city hundreds of kilometres away from Ashulia. These arrests come on top of at least 24 arrests of trade union activists and workers in December and January, the filing of charges against hundred of “unknown” workers and the mass dismissals of over 1,500 workers. Factories supplying for major high street brands including H&M, Inditex (Zara/Bershka), VF (North Face) and Gap have been involved in both the filing of criminal charges and the arbitrary dismissals of hundreds of workers. The arrests have been accompanied by a widespread crackdown on the legitimate organising work of the most active and independent trade union federations in the country. Police have vandalised and closed down union offices, and stolen equipment and union documents. Events organised by unions have been raided by the police, including events sponsored by the US government and the International Labour Organisation (ILO). Key union leaders are publicly harassed in the press, and union activists continue to be intimidated by the security services. Where trade union offices remain open, heavy police surveillance renders them inaccessible to workers, at a time when advice and support to protect their rights is most needed. Although the latest events represent a new low for the industry, Bangladesh unions have always had to operate within a long-standing atmosphere of anti-union repression. The International Labour Organisation has repeatedly condemned the failure of the Bangladesh government to implement laws that will bring Bangladesh in line with international standards, and the EU and US government have regularly called on Bangladesh to comply with its obligations under international human and labour rights conventions. So far these attempts at diplomatic pressure have failed to produce the required change, and stronger action is now required from the international community. In light of this activists are calling on the EU to do more to demonstrate its commitment to a more sustainable industry by launching an immediate investigation into the failure of the Bangladesh government to deliver on the human rights commitments on which its trade access under the ‘Everything But Arms’ programme is based. Clean Clothes Campaign has together with range of labour organisations protested the repression in two letters to brands and launched the #WagesNotJail petition calling upon brands to pressurise the factories where their clothes are made to drop the charges against the arrested labour leaders. The two brand letters can be found here (https://cleanclothes.org/news/2017/01/img/pdf/first-brand-letter-bangladesh-unrest/view) and here (https://cleanclothes.org/news/2017/01/img/pdf/second-brand-letter-key-brands-bangladesh-unrest/view). On 16 February there will be a global day of action at Bangladesh embassies calling for a halt to the union repression.